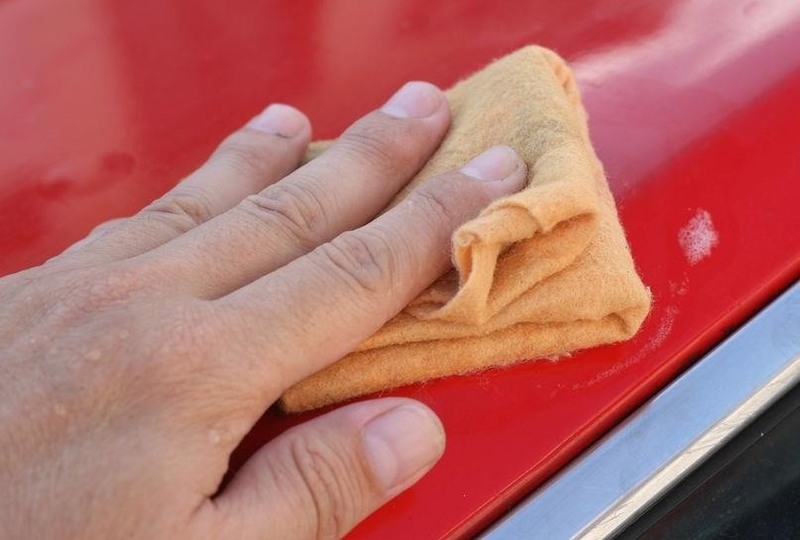 Just grab a damp, soft cloth and a smear of toothpaste, and you can erase scratches and scuff marks on your car without much work involved. This trick works best if the scratches and scuff marks haven't fully penetrated the clear coat of your vehicle's paint. If you can grab hold of a scratch with your fingernail, it might be too big to buff out with toothpaste. Toothpaste works to sand down the uneven surface of your car's glossy sheen and fills in the gap. Just make sure the surface around the area is clean—you don't want to buff particles of dirt and debris into your paint. If there is foreign paint on the outside, the toothpaste will act as an abrasive to help remove that, too. Add a dab of toothpaste to your damp cloth. Rub the toothpaste onto the scratch or scuff mark using small circular motions to cover its surface. As you move or lift the cloth, you should see the scratch or scuff mark disappear. When you see that the mark is gone, you're finished! Mike Shoesmith demonstrates the technique for scuff marks in the video below. If you'd like to speed up this process, as he demonstrates, you can use a buffing attachment on your drill. The scratch-removing magic of toothpaste works on your car's surface and a variety of other delicate items. Known to remove the scratches on CD and DVD discs, and potentially marks on the screens of your phone and tablet, it can be a smoothing wonder. But what makes it so effective? According to Ryan Dube of MakeUseOf, toothpaste is a sanding tool. It's like a lighter, softer form of sandpaper. As you gently rub toothpaste onto a slick surface, it "catches" on any imperfections that exist and softly sands them away, wearing away the uneven surface problems and polishing the surface clean. Although we don't think of our toothpaste as doing any sanding on our teeth, it's essentially performing this same task every time we brush. After all, how else would it remove the leftover pieces of last night's dinner and polish our teeth? However, buffing out scratches and scuffs with any old toothpaste won't cut it. NC Consumer, along with other sources online, says that whitening toothpaste is best. Whitening toothpaste works because of its rougher, grittier texture. Though you might not feel a difference in your brushing routine, it makes a significant difference when used on your car's paint. Whitening toothpaste contains small, barely discernible abrasives, ones that similar to the abrasives found in car polish. As you gently rub the toothpaste against your car, the abrasive action removes tiny layers of film and clear coat, polishing away those ugly marks and leaving a glistening mirror shine. If you're worried about using the wrong toothpaste or want to buff up your entire car (that'd be a lot of toothpaste), you could opt for some clay bars or a detailing kit, which do a great job getting your paint job as smooth as glass. What Else Is Toothpaste Good For? Once you've selected the perfect abrasive toothpaste, there's a lot you can fix with it. You can eliminate scuff marks on your shoes, turn your car's headlights clear again, and even get rid of those stubborn water rings on beat up furniture. And, of course, you can brush your teeth with it. Whichever way you use your toothpaste, remember it's a wonderful sanding tool in a pinch. when you wash the car does not it remove the toothpaste? It isn't the purpose of the toothpaste to fill the gaps/ scratches, its purpose is to grind down the higher levels of the car's clearcoat so that it is more uniform and, hopefully, appears scratch-free. You will have less clearcoat in the end, of course: toothpaste does remove some of it. 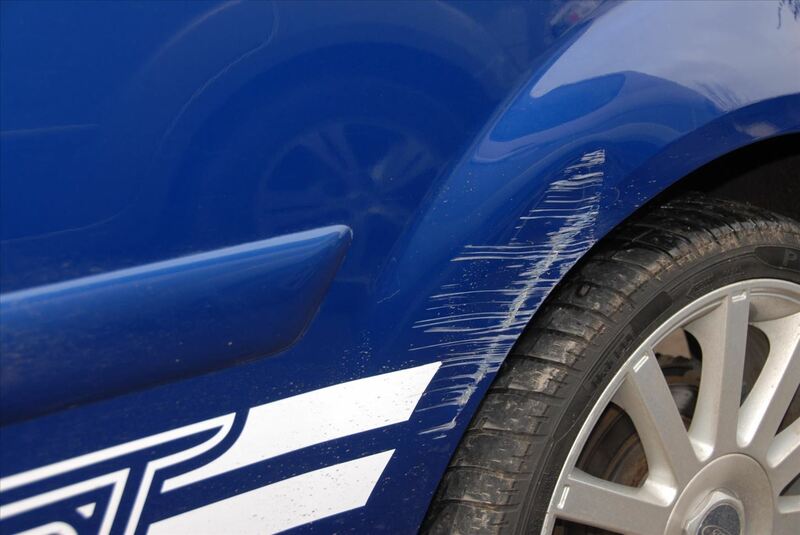 But if the scratches are shallow enough, this will make no visible difference in the appearance of your car. I'm still in shock about this! What a great solution for minor paint repairs on your car. After rubbing your car down with toothpaste, seeing as toothpaste is a fine sandpaper, is there a noticeable difference between the shine, or polish, of the treated spot? And, if there is a large area on your vehicle that needs treated, taking it a professional body shop may be your best option for fixing your paint job. Have also used toothpaste in the same way (without water) to polish silver. Another surprising, very fine abrasive/polishing compound is lipstick. Unless very cheap or hate the color, is best for a small scratch. does the color of the car matter? or can it be used on any color car? Unfortunately, this does not work on cars with lime green paint colors due to the fact that anyone who buys a car in this color does not deserve nice things. OMG I was in tears when our gate guard pointed out scratches on the front of my new Benz. I Googled this and IT WORKED! ALL the scratches GONE from my black car. Something had rubbed up against my car I think. Stupid mall parking! Hey did you really use the buffer to do this or just wiped vigorously? If you use toothpaste to remove degradation on your polycarb headlights (from UV), be aware that they will probably re-yellow quicker as you are not re-coating the polycarbonate with an anti-UV coating. This coating is usually supplied in the more expensive headlight reconditioning kits. Anybody have a suggestion for an anti UV coating? I saw this video about two months ago and I was intrigued enough to grab a tube of toothpaste and my electric buffer. I searched everywhere to find a scratch that met the parameters of this video, but found nothing. I was just about to put a scratch in my neighbor's car, but then I had another idea. It's a little messier than what was presented in the video, but my technique is a time-saver. Instead of a dab of toothpaste, I ran a three-inch line on the buffer pad, set the speed to medium, and went to work. It takes me about 5 seconds to brush my teeth this way and my neighbor said she doesn't mind the minty scent I splatter on the side of her house. This actually worked perfectly! Mine was from someone else's bumper. Minor scratch but mostly transfer. I rubbed some toothpaste on the scratch with a dry paper towel. And then wiped it of with a wet paper towel. It took less than 10 minutes to do. Really amazing solution! It has almost reduced the visibility of the scratches by about 90% in some places and lesser in areas where the scratches were deeper. But overall, a clear winner! So cheap and so effective. This can save you hundreds of dollars and a major heartache! Thanks so much for sharing this, very grateful indeed. Wow, this really works! Just scratched my car pulling into the garage and I was looking up what paint to buy and how to touch up the large scratch on the side of my Lexus. Even looked up what it would cost to fix , then I saw this toothpaste repair. Got out the whitening toothpaste and tried it. It works! Saved so much money and it took 10 minutes. Thanks to the person that posted this!!! I cannot even begin to thank you for this brilliant idea. Two weeks ago I received some tragic family news. Clearly I should have just stayed home and I did because when I went to pull out of the garage the door was not completely open and I SMASHED the rear window. My car is at the dealership and I have a brand new Mercedes loaner and I just scraped the back of the bumper. I just wanted to sit down and cry. I just used the toothpaste idea and it is hardly visible. Thank you so much for sharing this wonderful tip. You know...when you are having tough time...you need something to go right! Thank you Heather for the article. About to try this on my 2016 Expedition that I'm going to trade in. It has 2 scratches that are on the surface. The dealerships see these kinds of scratches and count off $$$ for them. 1/31/18. Just got new driving glasses to pass my DMV (I got Lasik monovision), and didn't judge correctly while backing my car out of my garage. So I got several scuff marks on my rear fender. I found this article by googling, and I used my whitening toothpaste. The paint came off immediately. But there's a shallow scratch about 2 inches long in the clear coat. Oh well, at least it's not obvious and the scuff paint is off. Thank you for posting this "how-to." Keep trying the tooth paste. My car's scratches were shallow too and I had to put a couple of applications of tooth paste on them. I applied the tooth paste with a damp terry cloth and then wiped the tooth paste off with a dry terry cloth. I had to use a little elbow grease as well. Wow. I just tried this after spending money on two scratch removers that did nothing. It worked great. Thank you !!!!!!! Wow! I'm impressed. This really works! Crest whitening, a little elbow grease and the scuff marks from scraping the center post of the garage are gone! So thankful I found this article! About to try that right now on my 2017 Nissan. My daughter was backing out the yard in my Toyota and got to close to the Nissan and transferred paint from one car to the other smgdh. I will let you all know my results. Been using the toothpaste for light scratches and skid-like marks on cars, even for clearing the lenses of the headlights.